It has always been great fun at the cats shows. 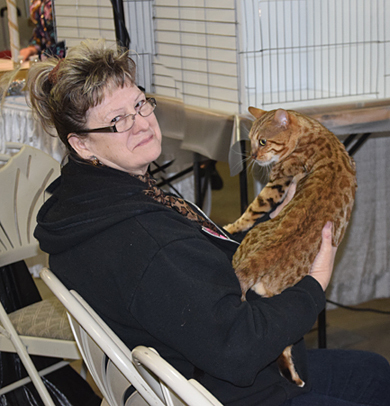 It allows you to meet a great group of people out to show there stunning cats. We will all go out to eat, share stores and enjoy each other company. 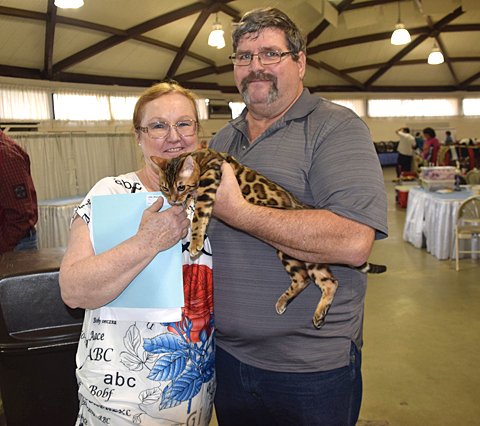 Sometimes we travel a great distance to go to a cat show so it makes it more fun and enjoyable to meet these wonderful people along the way. This beautiful boy is Cazpurr Captain Black Caesar of Potts Mountain owned by Keven and Jenifer my dear friends from Virginia. They live in the mountains of Virginia and they can sometimes look down off there porch and see the clouds below them. There new boy Captain Black Caesar is just starting to show and ran the rings in the last show in Raleigh, NC. Congrates and what a fantastic boy you have. This is Wayne and Brandy Little with there stunning new 2014 show boy. Cazpurr Captain Nemo of Atlantica. This stunning little guy is ink jet marked with a fantastic flow to his markings. Several donut rosettes which allows his pattern to look like a brand new leopard blanket. I am looking forward to seeing this stunning new males offspring. I would also like to take a moment to congratulate Nemo for his new 2014 show career. If interested in any of Nemo's kittens please click the link here go to www.Atlanticabengals.com. Meet Donna from BengalIslandcat.com. Donna is located in Virginia by the lake. Donna has some stunning cats as you can see as she is showing off her new boy that she is starting to show for the 2013 - 14 show year. Relaxing in front of the Judges ring while holding her newer show boy Cascade Rim's Tiramisu. Donna also owns Cazpurr Jazzman who is a Champion in TICA. Jazzman produced a international winner for the show season. Donna has been working on small ears, big eyes and the all in all look of the Asian leopard cat. I must say she is doing a great job.